Enter the divisor in the left-hand field on the line below (number greater than zero). The divisor is the number being divided into another number. If the divisor you enter is greater than the dividend, the result will be a decimal number less than 1. Enter the dividend in the right-hand field on the line below (number greater than zero). The dividend is the number being divided by another number. This is the result the long division calculator stopped at. Please double check this result with the result on the next line. This is the result you would likely get if you used a standard calculator for the division. This result is provided as a means to check the long division result for accuracy. Note that if the result contains more than 16 digits the last digit(s) is likely rounded. This is the whole number portion of the quotient. The quotient is the result of dividing one number by another. This is what is left after multiplying the whole number portion of the quotient by the divisor, and then subtracting that result from the dividend. 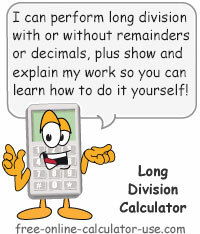 This calculator will divide one number (dividend) by another number (divisor) using the long division method, and show and explain each step. The calculator will accommodate divisors and dividends containing decimal points, and will give the remainder in both the whole number and the decimal format. Plus, unlike other online long division calculators, the calculated results will list the 1-9 multiples of the divisor to help you learn your factors, and will also report the detection of patterns which may indicate the result is a recurring decimal. Note that you are looking to multiply decimals, integers, or whole numbers, check out the Long Multiplication Calculator. Enter the divisor in the left-hand entry box. Enter the dividend in the left-hand entry box. Click the "Calculate Long Division" button. This will find the quotient of the division and display an interactive, step-by-step illustration of the long division. In order to show its work this calculator converts numbers to and from text while proceeding through the long division problem, which is not an exact science. Therefore be sure to check the results by multiplying the quotient by the divisor to make sure that product equals the dividend. Dividing whole numbers with no remainder. Dividing whole numbers with whole remainder. Dividing decimal numbers with no remainder. Dividing decimal numbers with decimal remainder. To follow the steps I took as I proceeded through each long division example, tap the info (i) icon on each row of the division process. Since 3 is greater than 1 you enter a zero in the 1st answer position and then combine the digit 1 with the digit from the next position in the dividend (4 in column #2) in order to form a number that is greater than or equal to the 3. That new number is 14. Since the greatest multiple of 3 that divides into 14 without going over is 4 (4 x 3 = 12), you enter 4 in the 2nd answer position and 12 in the subtraction row. Since 14 minus 12 leaves a remainder of 2 you enter 2 on the next line. Then move the next dividend digit (4 in column #3) down to that line to form the new subtrahend of 24. Since the greatest multiple of 3 that divides into 24 without going over is 8 (8 x 3 = 24), you enter 8 in the 3rd answer position and 24 in the subtraction row. Since 24 minus 24 leaves a remainder of 0 you enter 0 on the next line. Then move the next dividend digit (3 in column #4) down to that line to form the new subtrahend of 03. Since the greatest multiple of 3 that divides into 3 without going over is 1 (1 x 3 = 3), you enter 1 in the 4th answer position and 3 in the subtraction row. Since 3 minus 3 leaves a remainder of 0 you enter 0 on the next line. Since all dividend digits have been moved down, and the remainder is zero, the problem is solved. Since 3 x 481 does equal 1443, our solution checks out. Since 5 is greater than 1 you enter a zero in the 1st answer position and then combine the digit 1 with the digit from the next position in the dividend (2 in column #2) in order to form a number that is greater than or equal to the 5. That new number is 12. Since the greatest multiple of 5 that divides into 12 without going over is 2 (2 x 5 = 10), you enter 2 in the 2nd answer position and 10 in the subtraction row. Since 12 minus 10 leaves a remainder of 2 you enter 2 on the next line. Then move the next dividend digit (3 in column #3) down to that line to form the new subtrahend of 23. Since the greatest multiple of 5 that divides into 23 without going over is 4 (4 x 5 = 20), you enter 4 in the 3rd answer position and 20 in the subtraction row. Since 23 minus 20 leaves a remainder of 3 you enter 3 on the next line. Since all dividend digits have been moved down and you are left with the number 3, the remainder is 3. Since 5 x 24 + 3 does equal 123, our solution checks out. The first step in solving the problem is to get rid of the decimal point in the divisor 5.5. To do that, you move the decimal point 1 place to the right in both the divisor 5.5 and the dividend 220. Moving the decimal point 1 place to the right in the divisor changes it to 55. Since the dividend (220) has no decimal places, you simply add a zero for each decimal place you moved in the divisor. This leaves you with a new dividend of 2200. Note that a vertical red line indicates the position of the decimal point within the quotient (if applicable). Since 55 is greater than 2 you enter a zero in the 1st quotient position and then combine the digit 2 with the digit from the next position in the dividend (2 in column #2) in an attempt to form a number that is greater than or equal to the 55. That new number is 22. Since 55 is greater than 22 you enter a zero in the 2nd quotient position and then combine the digits 22 with the digit from the next position in the dividend (0 in column #3) in an attempt to form a number that is greater than or equal to the 55. That new number is 220. Since the greatest multiple of 55 that divides into 220 without going over is 4 (4 x 55 = 220), you enter 4 in the 3rd quotient position and 220 in the subtraction row. Since 220 minus 220 leaves a remainder of 0 you enter 0 on the next line. Then move the next dividend digit (0 in column #4) down to that line to form the new subtrahend of 00. The problem appears to be solved. Since 5.5 x 40 does equal 220, our solution checks out. The first step in solving the problem is to get rid of the decimal point in the divisor 3.33. To do that, you move the decimal point 2 places to the right in both the divisor 3.33 and the dividend 99.99. Moving the decimal point 2 places to the right in the divisor changes it to 333. Since the dividend (99.99) already has 2 decimal places, you simply move the decimal point 2 places to the right. This leaves you with a new dividend of 9999. Next, continue to add zeros to the dividend as needed until you either solve the division, or you reach the desired number of decimal places. Since 333 is greater than 9 you enter a zero in the 1st quotient position and then combine the digit 9 with the digit from the next position in the dividend (9 in column #2) in an attempt to form a number that is greater than or equal to the 333. That new number is 99. Since 333 is greater than 99 you enter a zero in the 2nd quotient position and then combine the digits 99 with the digit from the next position in the dividend (9 in column #3) in an attempt to form a number that is greater than or equal to the 333. That new number is 999. Since the greatest multiple of 333 that divides into 999 without going over is 3 (3 x 333 = 999), you enter 3 in the 3rd quotient position and 999 in the subtraction row. Since 999 minus 999 leaves a remainder of 0 you enter 0 on the next line. Then move the next dividend digit (9 in column #4) down to that line to form the new subtrahend of 09. Since 333 is greater than 9 you enter a zero in the 4th quotient position and then combine the digits 9 with the digit from the next position in the dividend (0 in column #5) in an attempt to form a number that is greater than or equal to the 333. That new number is 90. Since 333 is greater than 90 you enter a zero in the 5th quotient position and then combine the digits 90 with the digit from the next position in the dividend (0 in column #6) in an attempt to form a number that is greater than or equal to the 333. That new number is 900. Since the greatest multiple of 333 that divides into 900 without going over is 2 (2 x 333 = 666), you enter 2 in the 6th quotient position and 666 in the subtraction row. Since 900 minus 666 leaves a remainder of 234 you enter 234 on the next line. Then move the next dividend digit (0 in column #7) down to that line to form the new subtrahend of 2340. Since the greatest multiple of 333 that divides into 2340 without going over is 7 (7 x 333 = 2331), you enter 7 in the 7th quotient position and 2331 in the subtraction row. Since 2340 minus 2331 leaves a remainder of 9 you enter 9 on the next line. Then move the next dividend digit (0 in column #8) down to that line to form the new subtrahend of 90. Since 333 is greater than 90 you enter a zero in the 8th quotient position and then combine the digits 90 with the digit from the next position in the dividend (0 in column #9) in an attempt to form a number that is greater than or equal to the 333. That new number is 900. Since the greatest multiple of 333 that divides into 900 without going over is 2 (2 x 333 = 666), you enter 2 in the 9th quotient position and 666 in the subtraction row. Since 900 minus 666 leaves a remainder of 234 you enter 234 on the next line. Then move the next dividend digit (0 in column #10) down to that line to form the new subtrahend of 2340. Since the greatest multiple of 333 that divides into 2340 without going over is 7 (7 x 333 = 2331), you enter 7 in the 10th quotient position and 2331 in the subtraction row. Since 2340 minus 2331 leaves a remainder of 9 you enter 9 on the next line. Then move the next dividend digit (0 in column #11) down to that line to form the new subtrahend of 90. Since 333 is greater than 90 you enter a zero in the 11th quotient position and then combine the digits 90 with the digit from the next position in the dividend (0 in column #12) in an attempt to form a number that is greater than or equal to the 333. That new number is 900. Since the greatest multiple of 333 that divides into 900 without going over is 2 (2 x 333 = 666), you enter 2 in the 12th quotient position and 666 in the subtraction row. Since 900 minus 666 leaves a remainder of 234 you enter 234 on the next line. Then move the next dividend digit (0 in column #13) down to that line to form the new subtrahend of 2340. Since the greatest multiple of 333 that divides into 2340 without going over is 7 (7 x 333 = 2331), you enter 7 in the 13th quotient position and 2331 in the subtraction row. Since 2340 minus 2331 leaves a remainder of 9 you enter 9 on the next line. It appears the calculator ran out of room before it could complete the long division. Since 3.33 x 30.027027027 does not equal 99.99, either the calculator ran out of room before the long division was completed, the quotient contains a recurring decimal, or there is a rounding issue between the calculated result and the long division result. In this case it appears to be a repeating decimal. I hope I"ve managed to help you to understand how to perform long division. If not, please use the feedback form beneath the calculator to let me know what I have left out.